UPDATE 3 SEPTEMBER: Baaba Maal actively engaged with pro-Palestinian campaigners urging him to respect the Palestinian boycott call, seeming to leave open the possibility that he would not go to Israel on September 20. 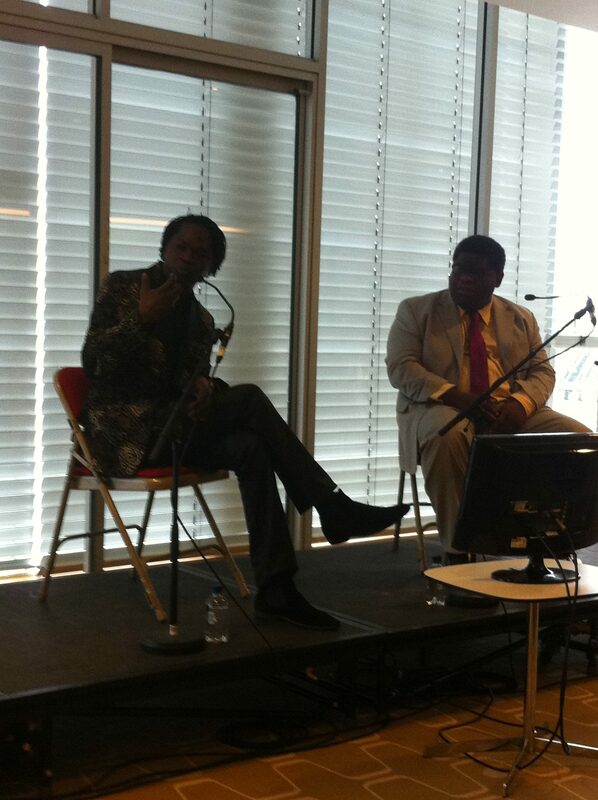 Baaba is pictured (left) in discussion with Guardian editor-at-large Gary Younge during the Africa Utopia festival at London’s Southbank Centre, where hundreds of Artists for Palestine UK leaflets were in circulation. A separate protest took place outside the building. Younge referred to his own experience as a participant in the Palestinian Literature Festival (PalFest) in which artists were obliged to travel to meet their audiences because Palestinians are not themselves free to move around. “Why would you go to a place where people can’t travel and there is a boycott going on?” he asked. Artists for Palestine UK, working together with campaigners in France, Senegal, Palestine and Israel, has addressed an open letter to the renowned West African musician Baaba Maal, urging him to withdraw from a planned appearance at an Israeli musical festival in the Old City of Jerusalem in September. A French language version of the letter follows the English text below. Musician Brian Eno, signatory of the UK Artists’ Pledge for Palestine, and Ohal Grietzer , a musician and activist with the Israeli group BOYCOTT! Supporting the Palestinian BDS Call from Within, made the following joint contribution to public discussion about the cultural boycott of Israel on Vice.com. Artists for Palestine UK is proud to be a partner in this new initiative . Make Apartheid History, the follow-up to Bethlehem Unwrapped, launched online on Saturday 18th July, and we held our first event at London’s Southbank with a programme of poetry and prose linking civil rights, anti-apartheid, and Palestinian solidarity movements.Edited highlights of performances by Paterson Joseph, Miriam Margolyes, Kika Markham, Leila Sansour, Jeremy Hardy and Sam West are here.